Good news. There is still hope for the endangered species of Bollstabruk. As the recent local news reports, there is even hope for our friends in Lunde and Mörtsal. You may never have heard of these places, nevertheless, any person looking for a summer house or a place to downshift life in tranquil and beautiful surroundings should pay a visit. You are most welcome. We need you. It will all come clear to you when you arrive. You will probably raise you hands in the air and shout ”Freedom”, never turn back from whatever crowded, expensive and competitive place you came from. 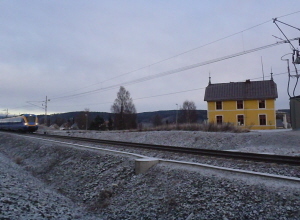 As for the train stations, a pilot study is initiated, to investigate the pros and cons of building train stations in the villages of Bollstabruk, Lunde and Mörtsal – ”mainly to facilitate for commuters… and may be of interest for turists travelling to the High Coast…”, says Henric Fuchs, traffic coordinator at Västernorrland County Council. Well, well, no offense to the High Coast area, a dream in itself, but don’t forget the undiscovered gems of the inland with lots of potential. Just think what you could do in a place where space is almost unlimited and you could aquire it for a small fraction of what it would cost in a high populated area. It’s not yet discovered, so hurry, hurry while it’s almost for free. Henrik Fuchs estimates that the pilot study will be completed in February 2015, maybe earlier. Earlier would be nice. Hurry, hurry Mr Fuchs and everyone else involved. We need train stations to get to work and and in order to delvelop our villages. We are endangered and should be on the red list. Bear in mind that the nextcoming elections for Riksdag, the municipal assemblies and the county council assemblies are held on 14 September 2014. It’s high time to check the puls on our local politicians. Are they still aware of the fact that they represent us? Are promises still promises after election day? Who is willing to work for train stations in Bollstabruk, Mörtsal and Lunde? Who is willing to speak about a vision for the country side, far away from shopping centers, roundabouts and terms of economic growth? Who is willing to work for a restoration of the Yellow Beauty of Bollstabruk and invest in cultural growth? Those are the kind of politicians I’d like to vote for.